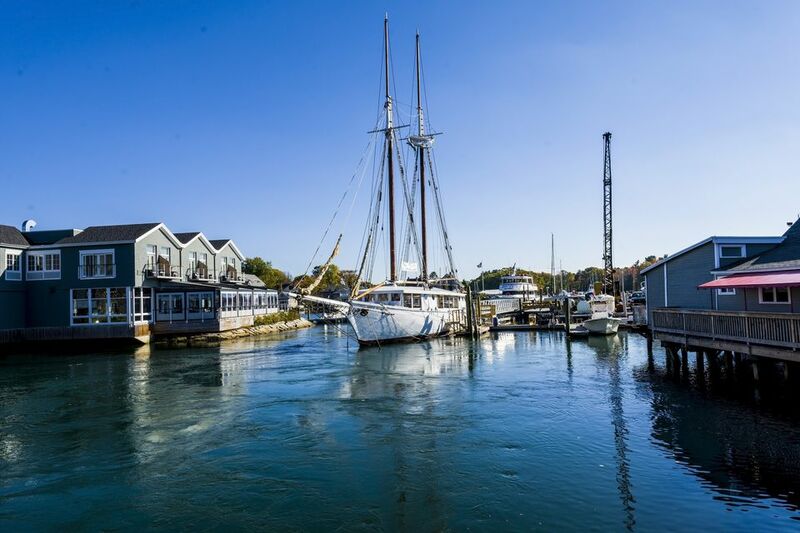 Easily accessible from Boston and other New England hubs, the adorable seaside resort town of Kennebunkport is chock full of dyed-in-the-wool, old-timey Maine charm. Bringing the family? Put these kid-friendly activities at the top of your to-do list. The coastal fishing town of Kennebunkport is nothing short of darling. Set aside time to walk around and discover the many shops and restaurants. The entire town center can be explored in a few hours, with all roads leading back to the Dock Square hub. For nearly three miles of soft white sand, head to Goose Rocks Beach, which is protected by an offshore barrier reef known as—you guessed it—Goose Rocks. This is an ideal spot for you to spread out your blanket, chairs, and umbrella for a fun day of relaxing, swimming and combing the shore for seashells. Just be aware that this beach has no lifeguard. You can't visit Maine without enjoying lobster at least once. While there are numerous fine establishments in town offering lobster rolls, baked lobster, and steamed lobster, for value and a kid-friendly atmosphere, we recommend Mabel's Lobster Claw, Arundel Wharf, and Cape Pier Chowder House. Nearby in Wells, the Rachel Carson National Wildlife Refuge is a magnet for nature lovers and birdwatchers. There are numerous easy self-guided tours of through forests and sea marshes on raised boardwalks, which offer the chance to see a variety of seabirds and other animals. There are plenty of places to enjoy ice cream in Kennebunkport, but for something special, head to Rococo Artisan Ice Cream where every day they offer 14 different flavors of hand-crafted ice cream on rotation. You'll have to make return trips to experience all the gourmet flavor possibilities, which include such decadent concoctions as Amarula Pecan, Coffee Pow, Guava and Maria Cookies, and Strawberry Habanero. Conveniently located in the middle of Kennebunkport, the First Families Kennebunkport Museum houses exhibits that illuminate centuries of local history. You can take a tour or peruse the wide variety of artifacts ranging from sea captains' belongings to items from George H.W. Bush's compound. Starting in the town of Kennebunkport and heading east along the shore, Ocean Avenue is a must-do coastal drive (or, for families with older kids, a must-do walk or bike ride) that delivers sweeping views of the Atlantic and the chance to ogle the many impressive mansions that line this stretch of road. You'll pass Walker's Point, where President George H.W. Bush's summer home (and gated compound) dominates a spit of land that juts into the sea. Got a sweet tooth? Make your way to The Candyman, you'll find over 50 flavors of homemade salt-water taffy plus lots of penny candy available by weight. The taffy is exceptionally soft and delicious, with flavors including blueberry, caramel swirl, root beer float, and the dubious-sounding "chicken and waffle." It's one thing to eat a lobster, and it's quite something else to watch lobstermen pulling in their lobster traps. Jump aboard the Rugosa, a classic New England wooden lobster boat, for a memorable Maine experience. You'll take a 90-minute tour of the Kennebunk River, enjoy a scenic tour of the beautiful coastline, and watch the crew haul their lobster traps. Along the way, you'll learn everything you wanted to know about lobster. Bring your camera and an extra layer of clothing on a chilly day. At the hip-yet-kid-friendly Lodge on the Cove, complimentary loaner bikes are provided (adult and kid sizes) for exploring the quiet streets around the resort (25 mph speed limit) and for making the easy-breezy half-mile trip into town. There's also a heated outdoor saltwater pool, a firepit for s'more-making, Ping Pong and shufflepuck tables, lawn games, and free breakfast and wi-fi. Reminiscent of summer camp, Hidden Pond is a secluded 60-acre resort that features 16 two-bedroom cottages, 20 bungalow cottages, a Tree Spa (treatment rooms are literally eight feet off the ground, nestled among the birch trees), an on-site 800-square foot organic Farm, two pools (one for families, one adult only) and the farm-to-fork restaurant, Earth. After dinner, grab a basket stocked with classic s'mores ingredients and enjoy dessert by the bonfire. Located minutes from Goose Rocks Beach, Sandy Pines Campground provides an experience that is authentically Maine, delivering ocean views, salty breezes and the ambiance of a darling seaside town. The property includes a lodge, rustic general store, and a multitude of resort-level amenities and outdoor activities. The park’s 320 campsites cater to tent campers, RVers, and glampers who can reserve one of 12 beautifully appointed safari tents created by 12 different New England designers.